I am totally unsure about how to close out this fabulous month of writing. I am so thankful to Two Writing Teachers for hosting this writing challenge! I enjoyed writing daily, I loved reading and commenting on others' posts, and I totally appreciated all the comments I received on my own blog posts. I think what really surprised me was that - with the exception, perhaps, of today - I was able to think of something new to write about each and every day. What a surprise, in the midst of what felt like a period of drought in my writing! I have learned an important lesson - Keep writing. Just write. Always write. I have one little preschooler who, no matter the day, cannot settle herself, stay quiet, or fall asleep at naptime unless she has a teacher's help. Truly, this is an amazing year because there is only one such student in the midst of a class of twenty-two preschoolers. There are several who are slow to nap and a handful who don't nap at all - but each of these is very quiet and respectful, able to self-soothe. Now, late March, this little girl and we teachers have our routine down - we first help everyone else in the room find their cot, lovey, special blanket, etc., and then one of us finds our way to her cot and sit down next to her, rubbing and patting her back. It actually has become a very sweet ritual. As I watched her fall asleep today, I thought I should try to capture some of this in a poem. Here goes! I'll watch her fall to sleep. She calls out to her friends. Her body twists and bends. She can't be dancing on the bed. But agrees to what I said. she tries not to make a sound. Then she calls "Ms. Ingram!" giving a pat to the ground. She asks, "Will you stay with me?" Now you must lay quietly." This napping becomes so hard. One day she will need no guard. And I pat her back some more. Her blanket falls to the floor. I pat her back in gentle rhythm. I know that's a sleepy sign. Then softly closes her eyes. For which there is no disguise. My Teaching Resident is working as our classroom lead this week, and she will take the lead more and more over the remaining weeks in the school year. This is always a hard and amazing time of year for me, as I struggle to step back, intervene, or fix situations, and, simultaneously, I watch the Teaching Resident grow before my eyes. Yes, hard and amazing. Our "transfer of power" is not understood by the children - or, actually, maybe it is immediately understood. It seems that the Teaching Resident's voice doesn't carry as much authority. The children find the small openings in her directions and expectations, and act in ways I have never experienced before. For a novice teacher, these new, unexpected behaviors are challenging and constant work. There's something about this time of year - when the Teaching Resident is leading - that always reminds me of the first six weeks of school. Today, things fell apart at clean up. Clean up! A routine that has been in place since day one...without a doubt, the children KNOW this routine. Oh my, did things fall apart. There was running. There was a just a wee bit of throwing. There was lots of disinterest, identified by children who sidled away from the work, hung out in one's cubby - avoiding. But the piece de resistance was the tantrums - three absolutely amazing loud, screaming tantrums, one feeding off another, bringing the room to such a level of discord...all because these three children did not want to stop playing. Wow. What was super impressive: my Teaching Resident stopped the clean up music and had everyone breathe in/breathe out. It took several minutes, but calm came back. (It helped immeasurably that I slipped two of the hysterical children for breaks in other rooms - there's no conversing with someone who is having a tantrum; save your conversation for when they are calmer.) Somehow we returned to cleaning, and then we went on with our day. Right afterwards, my Teaching Resident said - "Children, 1, Teacher, 0." It must have felt like she 'failed' or 'lost' - but, honestly, isn't this how we learn our best behavior management practices, having endured these tough situations? Later, we reflected together. We talked about reading the room - what clues did we miss that things were going to fall apart? Are there things that should be slowed down? Would it help to pull certain children aside before clean up and speak to them in advance/prepare them for what happens next? Would it help to talk to the class and reflect on what went wrong? Repeat expectations? Problem-solve together? So much to think about, so many possibilities. Tomorrow is another day and it will be better! I have learned through the years that the more precisely I have planned out my day, the more likely something unexpected will wreak havoc with these plans. I should have known that something new would be thrown my way today, when I was almost on autopilot from the get-go. The alarm goes off early, there is a very full day ahead. Everything is precisely planned. Make tea, do my morning workout, eat breakfast, shower and get dressed, head out the door. I'm not taking metro today because there is an evening meeting at school and metro service is much less regular in the evenings. I won't be home until 8pm; I'll drive to school. Throughout the drive, my mind races, as I review all my to do's of the day ahead. I park the car and start to walk away. "Your front left tire - it's really low - not quite flat. But you want to fix that." And I freeze. I just stare at the tire. Yes, it is really, really low. Can I make the 30 minute drive home with the tire like that? This is not a day when I have a moment to breathe. I'll be driving home in the dark. I know who will help me think this through. I call my husband as I walk towards school and I tell him the situation, to find out if he thinks I can get home on the tire. "Oh, I noticed that yesterday and I meant to take care of it. I'll slip over to your school and fix the tire while you are teaching." I think I have the very best husband in the world. A container of "whirly twirly lines"
We've been exploring found objects for several days. Today, I wanted to challenge the children to sort the items - to create "collections" of like objects. I've approached this in different ways through the years. Sometimes, I've suggested sorts or even put a few items of a certain type in various containers, just to get the children started. This year, I challenged myself to let the children be a little bit more in control...what would happen if I let them decide what the sort would be? What did they want to collect? I set out the found objects with several empty containers, as well. I wanted the children to hone in on something special. I invited the children over in small groups and I asked them - Which object do you like best? Which one do you find especially interesting? What do you notice about it? Then, I nudged them - can you find other objects that are similar to this one? One container of "long stringy things"; another of "things that hold things"
The small groups worked as teams to look through the remaining objects and find ones that fit each other's collections. Oh my, did these preschoolers ever amaze me! A container of "music things"
"things that can hold other things" - basically, creating a container of containers. My favorite may be the preschooler who put a block in side a can and then shook it, telling me "music! I like music." He proceeded to find things that made noise - tapping his thigh with a spoon, shaking a wheel, holding a pen cap up to his mouth and blowing noises onto it, telling me it was a harmonica. Really pretty funny! It is so fun and exciting to watch the way children think, and to see how hard they work to accomplish their goals. I am really thankful for this year's writing challenge - it seems to have catapulted me out of my writer's block. 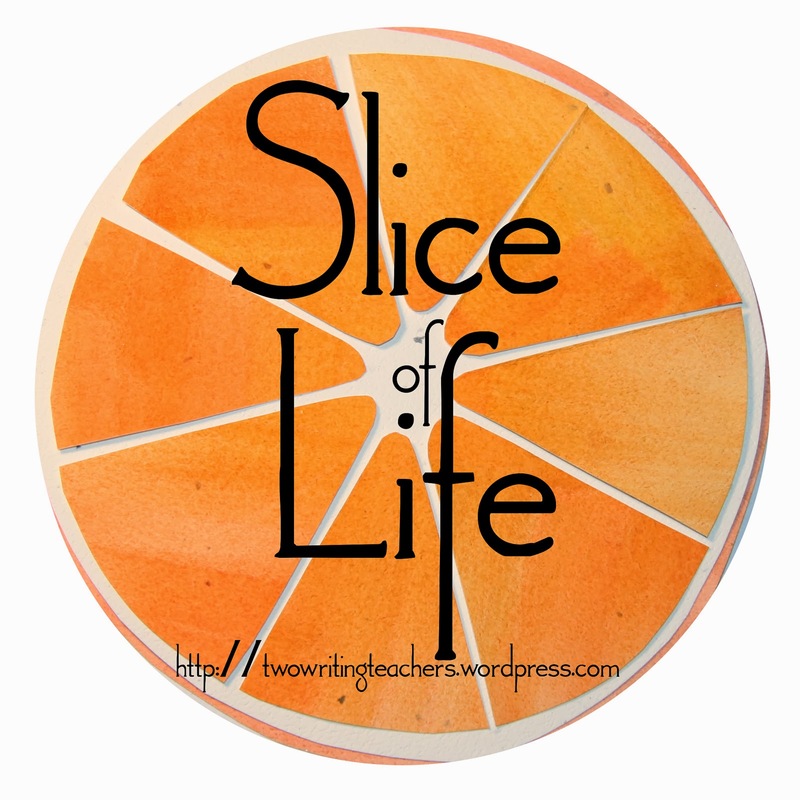 Although I have sliced with Two Writing Teachers for six years, by this fall I was rarely participating in the weekly slicing. I was not quite sure what to write. My blog had more or less come to a standstill. Why did I start having trouble writing posts? Awhile ago, an administrator asked me not to publicize my blog with families of my students. Mind you, I began writing this blog about early childhood long before I began working at my current school and, over the years, the families of my students were an ideal place to find readers, leading into conversations about real issues in early childhood. This administrator challenged me about the blog's existence, saying that this blog was not sanctioned by the school and did not represent the school, and that I should be very, very careful about what I write. It is true - this is my blog, filled with my thoughts, ideas, opinions, reflections, questions. It is entirely mine. It is not a school blog. It is my outlet, my writing, my pastime. I don't agree with or understand this administrator's perspective. Why not embrace and welcome teachers to write, think, reflect outside the classroom? Then along comes the March writing challenge! The reality of saying yes to this writing challenge: I don't get to wallow, I don't get to be blocked, I simply must write. All my questions have fallen to the wayside. Now I am wondering, why did I make room for that negative voice in my head? There will always be plenty to write about. I hope I can hold on to this writing habit after the challenge. "Some children left the table after only a short while, meaning that they were not engaged." However, I don't think how long a student stays in one place necessarily indicates that they are stimulated by the work. Should preschoolers be expected to stay in one place, to engage in a center? What if they think of something else they want to do, in addition to this? If they reach a stopping point, do we respect them enough to let them slip away? Isn't it possible that they will perhaps return to do more in this center later? What does engagement look like at age 3 and 4? Should teachers be insisting that children stay put, working in one place? Is the value of an activity directly related to how many students do it and for how long? Should teachers insist that every student participate in every activity? What do preschoolers learn when they get to decide what interests them? I have open centers, student choice. On the best of days, I have nearly 90 minutes of this time for preschoolers, with a range of things for them to do, investigate, play, explore, learn. This means, preschoolers move freely from and between block building, science investigations, art exploration, dramatic play, writing, and more. There are three teachers in the classroom and at least one is a "floater," moving about the room and observing closely; another teacher (or sometimes two) is anchored to an activity, guiding students in specific ways. I believe preschoolers should have the right and the privilege to leave the table, move away from a center, try another activity. I believe, as much as possible, they should be able to choose their learning. I believe that this flexibility of choice is developmentally appropriate practice. Certainly, my hope is that I have stimulated them with the activity that has been introduced. Of course, I know some preschoolers who resist new things, and I work with these students a little more, helping them to stretch and try. Simultaneously, I am trying to cultivate longer attention spans and the ability to keep at something, even if it gets hard or doesn't go the way you expect. Even so, I believe it is possible to work on things over time and sometimes taking a break is just what is needed. Hopefully, I am observant about each individual student, noticing what they do and reflecting on what they need. Argumentatively, there are so many individual circumstances that could change all meaning of what just happened! I guess you can tell that this line from my observation report didn't sit well with me! I walk away from my writing a lot. I'll write something, wander off and wash dishes or run a load of laundry, perhaps even go teach for the day, and then return to my writing, read through it, write some more, revise, and maybe wander off again. Do we respect this flexibility and choice in our youngest learners ? As I was exiting the metro train this morning, a young man endearingly called out to me, "Ladyglove." There was a brief mental delay on my part before I realized he had noticed that I left my gloves on the seat - and I thanked him profusely, with an embarrassed giggle. Not a morning to walk without gloves. A huge smile filled my face as I walked on, pulling on my gloves, and I repeated, affectionately, "Ladyglove, Ladyglove, Ladyglove." Funny that my first thought was that he was just being pleasant. Little things are so important. These are not big things, but they make the day so much smoother - like gloves on a cold day. Note - you know you are using new "thinking" muscles when you wake up in the middle of the night with a clear idea for a slice...that's exactly what happened here, proving this daily writing challenge is such a good habit! Let's call her Lillian. She is one of my calm, predictable children. She is always eager to see what is happening in a small group, 'ready to go' when you call her name. She is pleasant with her classmates, going along with their ideas and sometimes suggesting her own. I would like to hear a more independent voice from her, I'd like to hear more of her ideas. In conflicts, she might be reduced to tears and come find me to help resolve, but she is never physical in her reactions. Although this last note is such an asset in a bustling classroom of preschoolers, I would like to see her assert herself when she feels wronged. In short, we adore Lillian and she is a very engaged and happy preschooler. Fast forward - Dad comes to pick Lillian up at the end of the school day; he has picked up her older brother Calvin first. Calvin is a third grader and, though I never taught him, I sense that he has much the same temperament as his sister. It is atypical for Dad to pick up Calvin first; typically Lillian goes with Dad to get Calvin. Anyhow, Calvin is happily finishing his classroom snack, a packet of fruit snacks. Truly, from my perspective - Lillian went from Dr. Jekyll to Mr. Hyde. I think about how attuned I was to her social-emotional learning - how I would like to see her assert herself when she feels wronged. I bet these words would sound pretty funny to her family, who know her best in her role as sibling to Calvin. Are we our real selves around family? Do we act differently with different people? When are we wearing a mask, acting a role, doing something less authentic? "This is for screwing things in." "I can pull this piece off." "This goes around and around." "You can squeeze this part off." "This is a part of my Mommy's purse." "I want to open it." "It is very, very, very soft." "See, it is a triangle tape." We have just begun our found objects exploration, a yearly pleasure for me. At home, the children collected ten small, inconsequential, extra items - things their families didn't need anymore - and we will investigate and re-use in art, engineering, literacy, and math projects. Today, they dumped out their bags of these found objects and wondered aloud about their findings. These little bits of odds and ends are such curiosities! 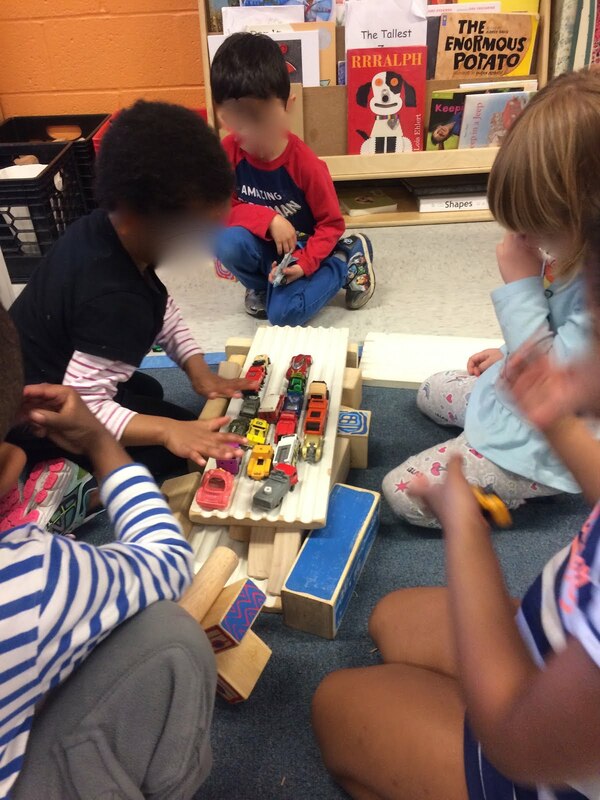 Hearing their non-stop chatter and watching them manipulate the pieces in unexpected ways, I once again was reminded -preschoolers are instinctively engineers, scientists, artists, mathematicians, and storytellers. Here's to the beginning of what I know will be a fun journey! All I want to do is sit back and record children's words and watch them think. "Do you know your pants are ripped?" I hear Ms. Wright, my Teaching Assistant, talking, but I keep moving because there is no way she is talking to me. "Ms. Ingram, do you know your pants are ripped?" "Wha-a-a-at?" I stop and look at her. "Me? My pants are ripped?" "Oh no they are not!" I insist. I mean really, it is the middle of centers and the children are playing, I have a small group to lead...I have a meeting to go to after lunch and I am meeting friends at a restaurant right after school, so, seriously, this is not happening, and besides, this has never happened before, I don't have extra clothes at school, and therefore, seriously, this is not happening. Ms. Wright is giggling. "Ms. Ingram, truly, your pants are ripped." "Well, is it just a little bit ripped? No big deal?" I reach behind and oh my goodness I can feel my underwear. The entire backside has split. What is happening?! How can this be?! What underwear am I wearing?! Is this really happening?! I shriek, "What!?! No! This can't be! What am I supposed to do?!" My mind is racing: Wasn't I just talking to Mr. Jones in the doorway and didn't I turn around to get those papers? Holy smokes. What did he see? What does he know that he doesn't want to admit he knows? This is humiliating! I shriek, "I cannot have ripped pants!" and I shimmy backwards toward my cubby. Several children say, "Let me see, Ms. Ingram!" Ms. Wright and Ms. Head start to problem-solve for me - "Didn't you wear a scarf? Wrap the scarf around like a sarong - you'll look glamorous!" Ms. Head grabs the scarf - "See, here, put it on, let's see!" For the rest of the day, there I was - dressed in a makeshift sarong around my jeans. I even went to dinner with it on. Do you know that no one - and I mean, NO ONE - noticed or commented on this new style of mine? This REALLY happened, this past December. I keep an extra pair of pants at school at all times now. Near the end of a day, when many children had been picked up, and the room was growing quieter and only a few children remained, she came to me and said, "Ms. Ingram, I have a song I want to share." "A song?" I asked, "Oh please do!" She began solemnly, "I have a song about Rapunzel. There's no sorceress, only a bad guy and the bad guy, he..." I realized immediately, this was not a song, certainly not a typical song, but a story, a sharing, an outpouring of words that this little preschooler was simply bursting to offer. I got out my pen and wrote her offering down. I love that she called it a song. I love that she knew I would want to capture it, that I would write it down and read it back to her. I love that I have created the space for such sharing to happen. I worry that I am not hearing everyone's stories. I worry that my days get too busy, that I have too many to do's. I worry that one day someone will say, "excuse me, that child is not focused on what is in your lesson plan for this part of the day." Well, I don't really worry about this happening to me, because I would no longer be teaching if that were the expectation. But, honestly - it is happening in classrooms. Yes, even in the preschool classroom, there is an ever-increasing burden for writing detailed lesson plans, noting each and every standard or objective you will teach. I worry about novice, less-experienced teachers who bow to administrations that ask this of them, who faithfully expend hours making the minute and predictive details of curriculum planning and who teach to these plans, but have not the time to observe, or reflect on, or to be truly present with their students. If the expectation is on the paperwork, the forms, the "shell" of teaching, how do teachers learn to focus on the individual student, to create a classroom that builds on children's own interests, and where children are curious, investigating, moving, conversing, trying, questioning, wondering? This little girl and her story song - these are opportunities woven like a golden yet invisible thread into the fabric of my planning. You won't find them listed anywhere in my plans. These moments are when I feel my teaching is at its best: children who have been so riveted by books, so engaged by their play, so delighted by dramatizing stories, so lost in their learning, that they must, simply must, tell you all about it. We teachers must be there to listen. Isn't this what children deserve? He will not do what he should. And runs when it's time to walk. tapping his foot, like a stage. Shh! Shh! Take care! Please! Be kind! The song we practiced today.